Globitel Speech Analytics solution, SpeechLog Analytics, is a powerful and comprehensive solution which has the ability to convert speech from contact center call interactions into text. SpeechLog Analytics offers a wide range of features that will ultimately transform your contact center into a customer service powerhouse. Through SpeechLog Analytics, you will be able to shape your contact center’s KPIs, enforce agent script adherence, save costs, derive business intelligence, and more which will be explored later on. In addition, the solution provides functionalities that help contact centers measure agent performance. Your contact center will have access to pockets of information relating to call topics, agent non-silence ratio, block count, agent speed, interruption rates, first call resolution, etc. Globitel’s SpeechLog Analytics covers two important contact centers’ focus-poles; Customer Satisfaction Levels & Agent Script Adherence. It is a powerful module integrated with Globitel SpeechLog Call Recorder and SpeechLog Quality systems to enhance quality management, adding the ability to convert all call interactions to text. Speech analytics is an asset in improving customer service, turning speech into analysis-enabled content. SpeechLog Analytics Enhances service quality by monitoring interactions effectively. It assists in meeting customer satisfaction goals and achieving efficient customer retention at the contact center. Reduces operational eff­orts through automated and smart verbal coherence and call type identification; removing the need to spend time and eff­ort listening through a whole conversation to detect key points. This gives contact centers the ability to capture specific conversation content in big recorded data. Enables cost saving by achieving customer retention and enhancing eff­ectiveness of marketing campaigns. It also enables revenue generation by identifying ideas for new market-relevant products and cross-sell/up-sell opportunities. According to Contact Babel, the use of Speech Analytics in contact centers improved sales conversations by 41% and collections revenue by 20% by identifying skills that differentiated top performing agents vs bottom. SpeechLog Analytics helps the engagement center in directing the service provided by agents, and coaching them on script adherence and word use; ultimately enhancing customer loyalty and the organization’s service delivery. SpeechLog Analytics provides metrics that can be used by the organization at large, to project market insight and eff­ectively build revenue-increasing business strategies. Full text indexing in SpeechLog Analytics which enables high performance and flexible text search, allows users to extract unlimited amounts of terms by creating various queries and parameters. Advanced player will have capabilities that highlight customer and agent text in synchronization with audio playing. It shows the areas in the conversation where interruptions, overlapping, speech block, silence, and hesitation took place. In addition, the search word of the selected query will be displayed when it occurred. By clicking on the word, the moment of its expression can be listened. The information regarding the number and owner of the word spoken is also available to the user. Users can define topics with fields such as topic name, description, call direction, voice channel, skill group, conditions, etc. This allows the system to automatically tag call interactions with identified topics and provide analytics on call reasons. Globitel’s SpeechLog Analytics offers an Excluded Words model. This purpose of it is to hold a record of all omitted words from the word counter in order to prevent them from further analysis. To incorporate these words in future analysis, the user needs to delete them from the Excluded Words module. Globitel’s Speech Analytics solution – SpeechLog Analytics – can support multiple languages including Arabic and English. Globitel is also known for having a fast track for developing new languages enablement upon request. Automatic Evaluation is a new functionality that will be added to Evaluation module that has the capability to evaluate calls automatically using predefined criteria in evaluation forms based on metadata and text calculated by Analytics Integration Service. Globitel’s Speech Analytics solution – SpeechLog Analytics – offers a phonetic feature that can capture and analyze different vocal KPIs which include, agent and customer speech, silence and non-silence, speed, interruptions, overlap, and block count. Speech Analytics has the ability to separate text and phonetic features for each side of the conversation. SpeechLog Analytics will automatically secure and protect private client information when communicated through a call interaction. Non-Silence Ratio Analysis: Non-Silence Ratio Analysis will display the average non-silence ratio on a daily basis depending on specific search criteria. The efficiency of a contact center is determined by the ratio of non-silence duration to total call duration. Thus the calls whose silence duration is lesser are more efficient. Call Count Analysis: Calls Count Analysis will display the number of calls count on a daily basis grouped by skill group or topic. Words Analysis: Words Analysis will display a statistical comparison between the number of top words used by the agent and the customer according to specific search criteria along with the ability to compare different time periods. 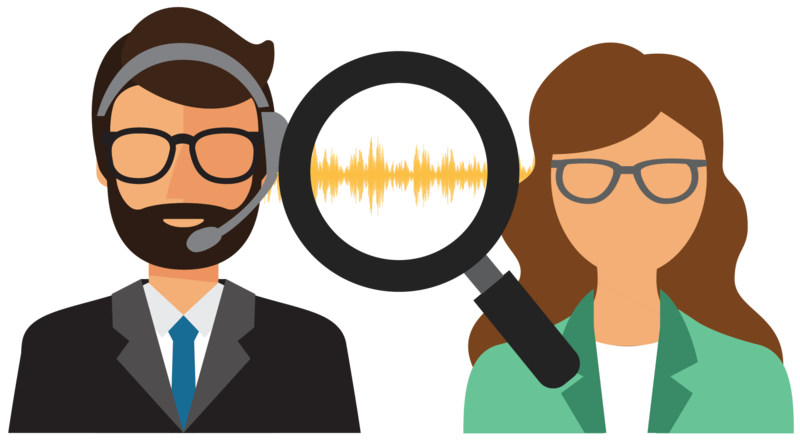 Agent Performance Analysis: Agent Performance Analysis will display a calls statistics related to speech analytics for each agent depending on specific search criteria. First Call Resolution Analysis: The First Call Resolution (FCR) highlight the calls served from the first call. FCR is an important key performance indicator (KPI) that measures the effectiveness and the efficiency of a contact center. Reports generate First Call Resolution Analysis which details root cause analysis through the root cause analysis tool, as well as a measurement tool to demonstrate FCR performance per skill or agent. Speech analytics engine: this is the engine which analyzes audio files and extracts spoken words from it. SpeechLog web: web interface will present results to the end users.